Calcalist reports a group that includes food chain owner Rami Levy will take over the firm that developed the Jerusalem neighborhood. Investment house DS Apex has sold its share of the ownership of Digal - the bankrupt company that developed the Nof Tzion real estate project - to a body representing "nationalist Jewish investors," according to financial website Calcalist. The buyers paid 11 million shekels for the one-third of Digal's shares. The investors will tip the scales in the shareholders' vote Tuesday afternoon, in favor of selling the project to a group that includes food chain owner Rami Levy and an American investor, and against a bid by Arab businessman Bashir Al-Masri. The Jewish buyers' offer is reportedly identical to the one made by Al-Masri. In a late-night post on its Facebook site Monday, activist group "my Israel" (Israel Online Ambassadors) informed its members that "it seems at the moment that [the purchase] has indeed been blocked," and "numerous forces" are acting to complete a deal that would transfer ownership of the neighborhood to Jewish hands. Another report that appears to confirm that Nof Tzion is safe from a hostile buy-up appeared on the Maariv-NRG website. Under the headline "Racism in Business, Too," a column by financial editor Yehudah Sharoni bemoans the collapse of the Arab attempt to purchase the neighborhood. 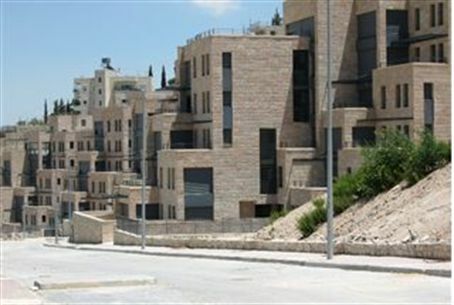 Sharoni tells his readers that Digal, the developer of Nof Tzion, is in financial difficulties and was about to be sold to Al-Masri, until "an attack by settlers" on Digal's creditor - Bank Leumi - torpedoed the deal. Sources close to attorney Dov Weisglass, who represents Al-Masri, told Sharoni that the bank has "caved in to settler pressure and that therefore Digal will not be sold to the Palestinian investor after all." Sharoni explains that 100 of the neighborhood's 300 planned homes have been bought by religious Jewish families and that the investors fear the Arab buyer would sell the rest of the neighborhood to Arabs. "Sources close to Masri denied that they intend to harm the Jewish apartment buyers and stressed that he intends to create a partition between the tenants," he writes. This last line appears to be an indirect confirmation that the Jewish concerns were justified, and that Al-Masri planned to sell the rest of the neighborhood to Arabs, and then (perhaps) build an "apartheid wall" between the Jews and Arabs. Calcalist also reported that Al-Masri intended to house Arabs in the remaining 200 homes. An attorney representing opponents of the Al-Masri deal demanded Tuesday that Bank Leumi refuse to accept the check written by Al-Masri because it violates the law against money laundering. Attorney Mordechai Mintzer informed the Authority against Money Laundering and Terror Financing that checks from PA banks are not acceptable in Israel because of the PA's refusal to define certain groups as terror organizations.